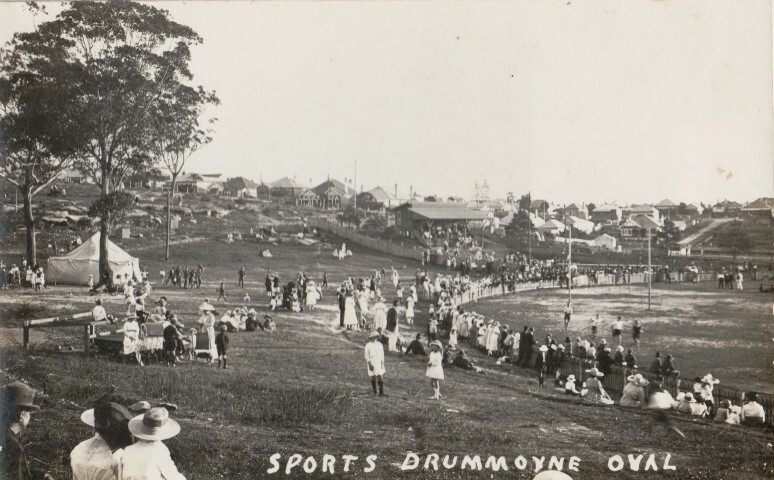 An early photograph of Drummoyne Oval has recently been added to Canada Bay Connections. Thanks to Phil Harvey (see comment below), the photograph has been identified as being taken prior to 1920 and shows the original grandstand. The ‘Sports’ of the photograph is, of course, Rugby. Drummoyne Park was used for rugby games as early as 1882 when the area was part of William Wright’s estate. Kevin Stutchbury kindly lent the photograph so it could be scanned and added to Canada Bay Connections. While baseball was first played in Australia in the nineteenth century, it was the visit of the American Fleet in 1908 that particularly boosted interest in the game. In that year baseball first began to be played in NSW schools. By 1914 St Bede’s (Anglican Church), Drummoyne had a well organised baseball team. 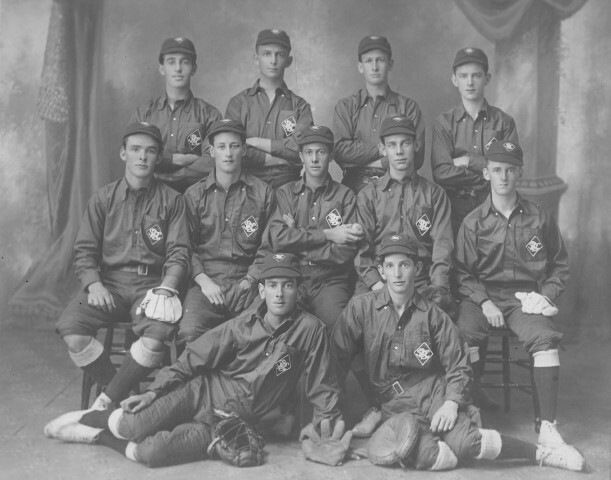 Players in the photograph, above, were back row: A. Norman (Pitcher), H. Kay (1st Base), L. Kay (Catcher), Honorary Treasurer E. Gordon (Centre Field); second row: F. Hall (3rd Base), A. E. Kelshaw (Short Stop), Captain A. Mackenzie (2nd Base), Vice Captain and Honorary Secretary E. Stutchbury (Right Field); front row: E. Boon (Left Field), A Parsons (Centre Field). It appears that at least six of the young men enlisted in the First World War. Brothers Harold Brooks Kay and Leslie Frank Kay, Ernest Gordon, Frederick Poole Hall, Albert Edward Kelshaw and Eric William Stutchbury. Ernest Gordon was killed in action in 1917 but the others all returned to Australia after the war ended. Eric Stutchbury became a Major in the 55 Battalion and was highly decorated, being awarded a Military Cross with Bar. The photograph of St Bede’s Baseball Club was recently donated to Local Studies by Major Stutchbury’s son, Kevin. Seniors in the City of Canada Bay are invited to come along to Concord Library on Wednesday, 3 June, 10-11.30am for a talk by the Local Studies Librarian who will share stories and photographs from our extensive collection. The Local Studies online pictorial collection, ‘Canada Bay Connections’ now has over 7000 local images, ranging from the nineteenth century to the present time. It will also be a chance for Seniors to share some of their memories of the area over morning tea. It’s a free event, however please RSVP by Thursday, 28 May to our Client Services Coordinator on 9911 6311. 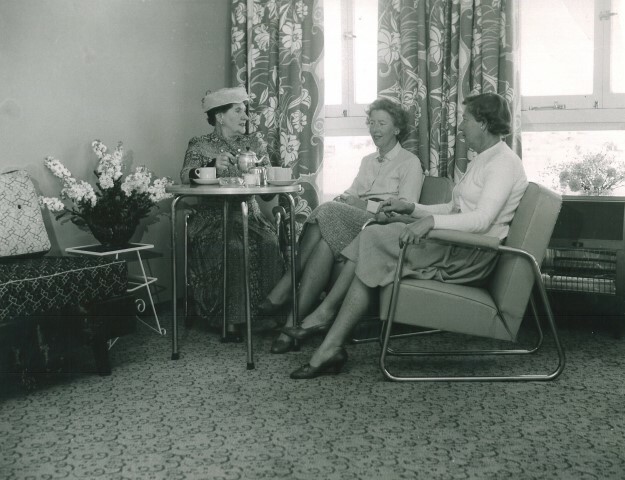 The photograph shows ladies enjoying tea at Massey Park Golf Club House, Concord not long after it was opened in 1957. Cut into solid rock, the Chiswick Steps originally led to a wharf which was serviced by ferries plying the Parramatta River. There was a ferry service to Chiswick from 1905 until 1928 when it was superseded with the introduction of a bus service. In 1914 when the Tulley family moved to Blackwall Point Road there were only about twelve houses at Chiswick. The Tulley’s operated a general store at Chiswick from 1928 until 1987. The Tulley Brothers, Jim and Bill, recalled having furniture delivered by the ferry and the difficulties experienced in getting it to their home via the 72 Chiswick steps. The wharf was damaged by fire in the 1940s and finally removed in 1958. Of the original 72 steps, only 62 remain today. 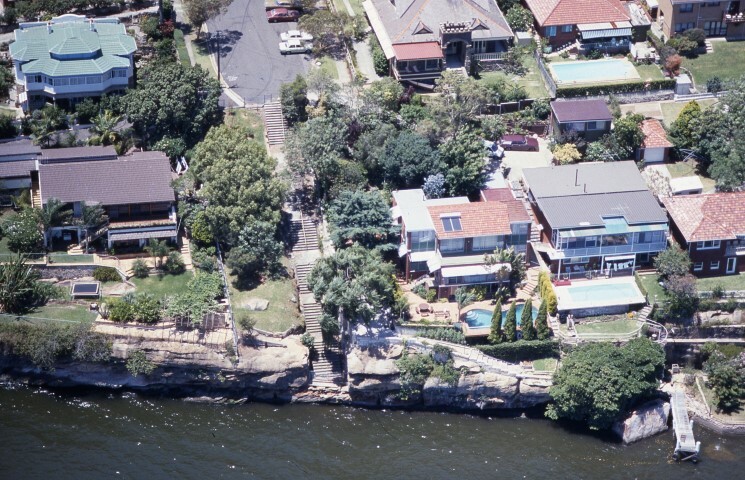 The aerial photograph of the Chiswick Steps was taken in about 1980. 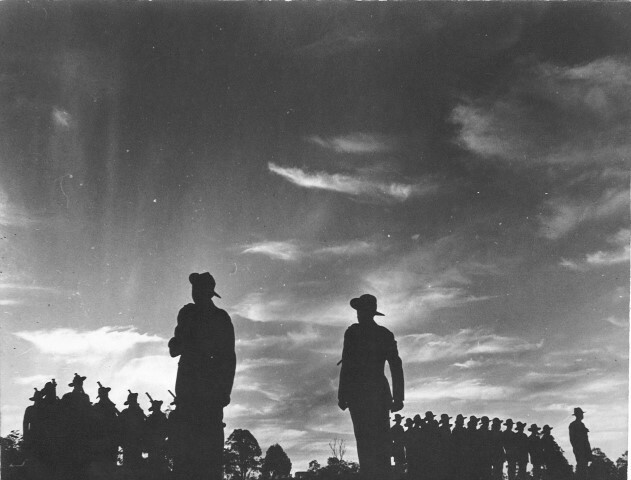 This year marks the seventieth anniversary of the end of the Second World War. The end of the war in Europe, known as VE Day (Victory in Europe), was on 8 May 1945 while in the Pacific, VP Day (Victory in the Pacific) was marked on the 15 August 1945, following the unconditional surrender of Japan. Locally, there were thanksgiving services to mark VE Day and VP Day on the Flavelle Estate at the corner of Flavelle and Wellbank Streets, Concord. Although the estate was at that time still occupied by the Flavelle sisters, the land had been set aside as the location for Concord Council Chambers. Concord Library and Wellbank Children’s Centre was built on the site in 2008. The photograph, above, was taken in New Guinea by Bob Tait, a descendant of W. S. Tait of Liryclea, Russell Lea.